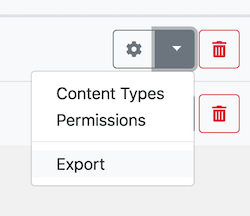 You can export settings (including content type and permission settings) of your directory which can then later be imported to setup a copy of the directory without re-configuring the settings. Under the All Directories tab, click the dropdown button next to the gear icon in the row of your directory and then click Export. In the popup form, enter the file name of the JSON file that will be exported. Optionally select Yes for Pretty-print JSON to export readable JSON. Click the Export button at the bottom of the popup window. A progress bar will show up indicating the current status of the export process. When the export is complete, the exported file will be downloaded automatically by your browser. If not, you can click the Download button that appears at the bottom of the popup window to manually download the exported file. You can create a new directory by importing settings of a directory that have previously been exported. Click the Add Directory green button under the All Directories tab which will open a popup window. In the popup window, choose Import from a file for Choose a method. Click Choose File and select the JSON configuration file that you exported earlier. Optionally enter Directory label and Directory name if you wish to change them from the ones set in the configuration file. Click the Add Directory button at the bottom of the popup window. A progress bar will show up indicating the status of the directory creation process. Make sure that you do not close the window until the process is complete. When the process is complete, the pop window closes and you will be redirected to the main administration page of the directory created.